A day in the life of T. rex is an engaging non-fiction reader that will help make learning to read fun and interesting. Journey back in time to discover all about this fearsome dinosaur and along the way you’ll also read about many of T. rex’s dinosaur neighbours, including Struthiomimus, Ankylosaurus and Edmontosaurus. The Reading Ladder series helps children to enjoy learning to read. It features favourite topics, well-loved authors and classic characters so that children will find something to excite and engage them in every title they pick up. It’s the first step towards a lasting love of reading. 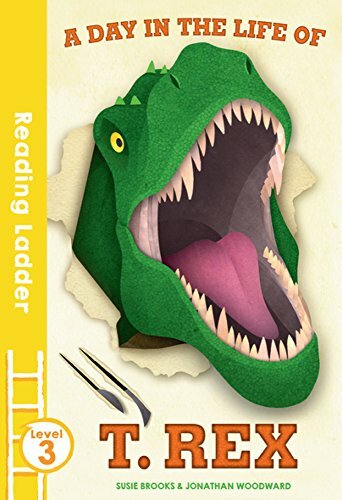 Level 3 Reading Ladder titles are perfect for fluent readers who are beginning to read exciting, challenging books independently. Award-winning author, Susie Brooks has a first class history of art degree and has worked as an editor and author of children’s nonfiction and picture books for over 10 years. She’s an artist herself and sometimes runs workshops for young children. Jonathan Woodward is an environmentally-friendly wildlife illustrator, working with a mixture of cut paper and digital collage. His work has been used by zoos, aquariums, educational toy companies and publishers, and Jonathan was also a commended finalist in 2011 and 2012 in the BBC Wildlife Artist Of The Year competition.